During the early years of the Great Depression, Alice Neel was one of the 3,749 artists who participated in the predecessor to the Federal Arts Project of the Works Progress Administration (WPA), the Public Works of Art Project, which operated during 1933-34. Neel’s paintings were included in two 1977 exhibitions of WPA artists of the 1930s. One was a travelling exhibition organized by the Gallery Association of New York; another was held at Parsons School of Design. The historic exhibition, Neel’s first show in a private gallery in the South, featured several of the works illustrated in the book, including the 1931 pencil and watercolor “Kenneth Doolittle” shown on page 43; the 1932 watercolor and collage titled “Christopher Lazar” on page 47; the 1958 oil on paper of John Rothschild titled “Man in Striped Shirt” on page 74; and both of the 1949 ink on paper drawings of “Judge Medina” and “Angela Calomaris” on page 87. 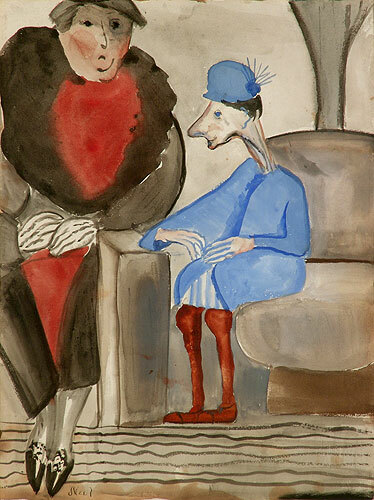 In her review, Dr. Schmitt noted that the artist’s social concerns were lifelong. “Her early socialist convictions, scarcely mellowed today one senses, provide the thread of continuity for several drawings in strikingly different styles. Where the political message is strongest, as in The Bowery (early 1950s) and the caricature of the hated Communist-chaser Judge Harold R. Medina and his witness Angela Calomeris (1949), the technique is at its most strident, unpleasant, and laborious in its avoidance of grace. Only one oil on canvas was in the exhibition, the five-foot portrait that Alice did of Virginia Miller just a few months before her Coconut Grove show. “Alice asked me to sit for her when we met at a two-day seminar at the New School in late 1977,” recalls Miller. “I was on a panel on functioning in the art world with Louise Nevelson, the art dealer Jacques Truman, art insurer Huntington Block, and several others. Alice was on another panel that included art dealer Ivan Karp and the prominent curator and critic Henry Geldzahler. “As far as I know, mine is the only painting Alice Neel ever did with that sort of abstract expressionist background,” Miller says.